This map shows air quality in your area, updated hourly. The EPA also has the Air Quality Index for dozens of California cities. 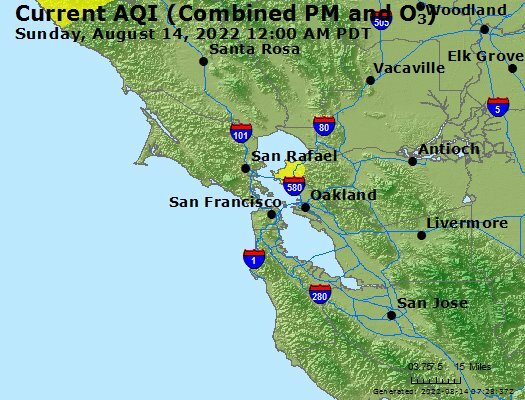 The BAAQMD has current and recent AQI from individual monitoring stations. The private company PurpleAir maintains an interactive, crowdsourced AQI map. Check here for a complete list of resources. Here is how to protect yourself from wildfire smoke. Click here for the Five Day Forecast. The Air Quality Index, or AQI, much like an air quality "thermometer", translates daily air pollution concentrations into a number on a scale between 0 and 500. The numbers in this scale are divided into six color-coded ranges, with numbers 0-300 as seen below.